3 of 5 DeliciScore™ (Good) Awarded to Le Grand Bistro Américain for their Prime Rib Dip Sandwich in Kirkland, WA on this 28th day of March, 2016 - Good service makes a big difference. Yes, yes, y'all! I started a new--and my first ever--diet two Saturdays ago. 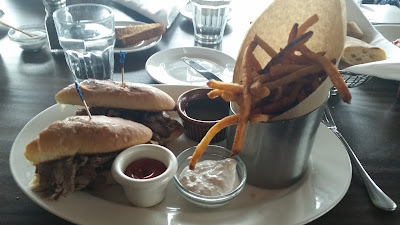 On this diet, I had to wait eight whole days to eat carbs so I was pretty sure that this French dip would be really good or a major let-down. 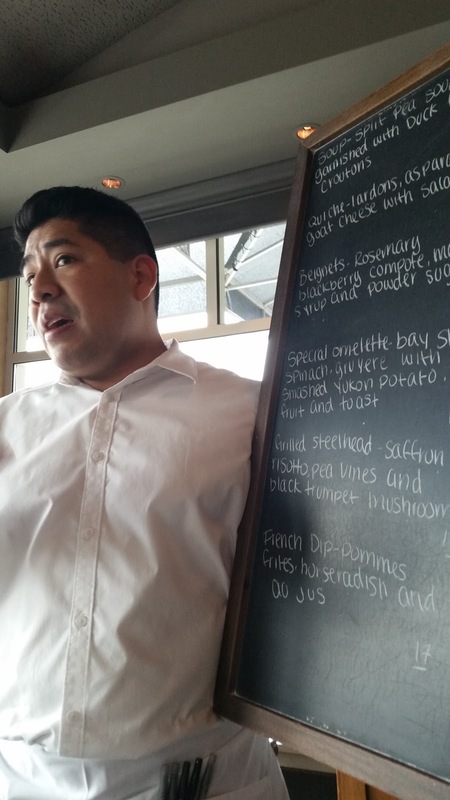 We were at Le Grand Bistro Americain, an upper-end bistro type of place at Carillon Point in South Kirkland with views out to Lake Washington. It was Sunday brunch, I was with Jessica, and we were celebrating some friends' birthdays. Probably 12 others joined our so we had a good time. And I got to eat my favorite meal. 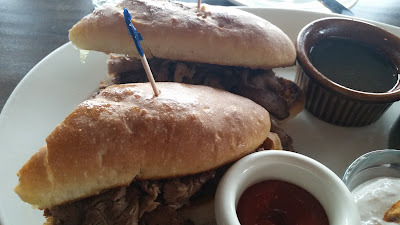 On arrival, I asked the hostess if they had a French Dip and she said yes. I felt fortunate. I was fairly stoked and anticipatory while waiting to be seated, ordering, etc. It had been eight whole days since carbs or butter. I was going to eat that and fries. Yum yum. So here's my review. Pictures are below. Garlicky taste. The french dip had a definitive garlic taste to it and I don't necessarily mean that as a compliment, just that it was garlicky. Good jus but not enough or hot enough. The jus that they gave me was in a very small container and had a nice wine taste to it but it was neither enough nor was it hot enough. I was pleased that the nice (but not warm enough) wine-flavored jus helped a little but again because it wasn't hot nor sufficient enough we had a problem. There is a chance my lack of satisfaction was caused by the cooks trying to feed my large party at once. Some of the lack of quality in this dip may have been caused by the size of our large party and their need to time the arrival of all things at once but I was still disappointed. Give real horseradish. The meal came with a side of "horseradish cream" which was no big whoop; I prefer the authentic horseradish. Great crispy fries. I order fries as a side and they were very good and crispy fries, strongly recommended. Meat. 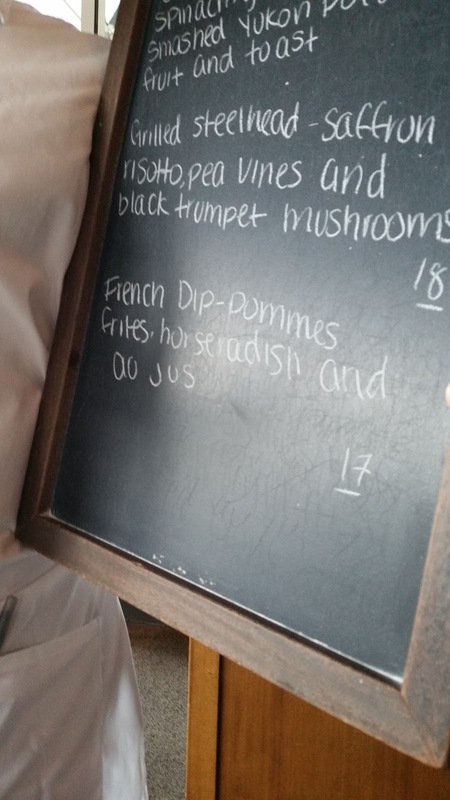 I was disappointed while ordering the dip that while it was prime rib, I was not able to select the rareness of it. The meat itself did wind up being quite dry and there were no slabs of prime rib so I wasn't impressed by the meat. Fair size. The size was okay/pretty good. Pretty good bread. The bread was nice and toasted but it wasn't to die for. Sandwich not to die for. The sandwich by itself was only a 3 of 5 at best so I was disappointed there, especially for the $17 price tag. There is hope. Overall, this French dip scored a 3 of 5 overall and I would not recommend it unless the waiter could guarantee hot and ample jus. 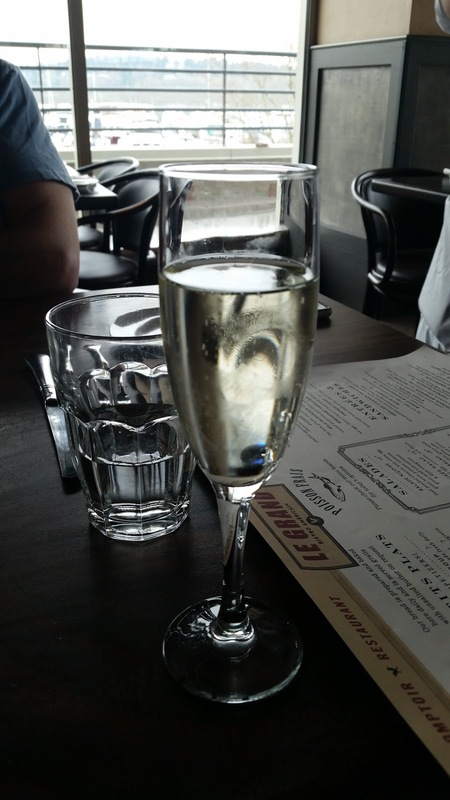 I went with a glass of champagne, since I could and since there was celebration going on. It was rainy outside. Here's the fellow showing us the specials. Note at the bottom the French Dip for $17.00. I went with that. In case you really wanted to see the writing, here's a closer shot. Note the black trumpet mushrooms that came with the Steelhead. Next time maybe I'll get that instead. Here's the French dip (FD), plated. You can see the horseradish mayo. The fries were quite delicious (excellent, I might say). The jus was too small in volume. The sandwich itself looked good but was served medium to medium-well, which is not really the way to glory. There were blue-tasseled toothpicks. The bread was nicely toasted. I have no idea why anyone would think that that little jus is justified. I paid $17. I should get more jus. I like jus.